A Father's Lullaby is a multi-platform co-creation project that highlights the role of men in raising children and their absence due to the racial disparities in the criminal justice system and its direct impact on children and women of lower income communities. The project invites men to participate by singing lullabies and by contemplating on concepts such as home, nurturing fathers and childhood memories. The project is centered on marginalized voices of absent fathers while inviting all men to participate by singing lullabies and sharing memories of childhood. 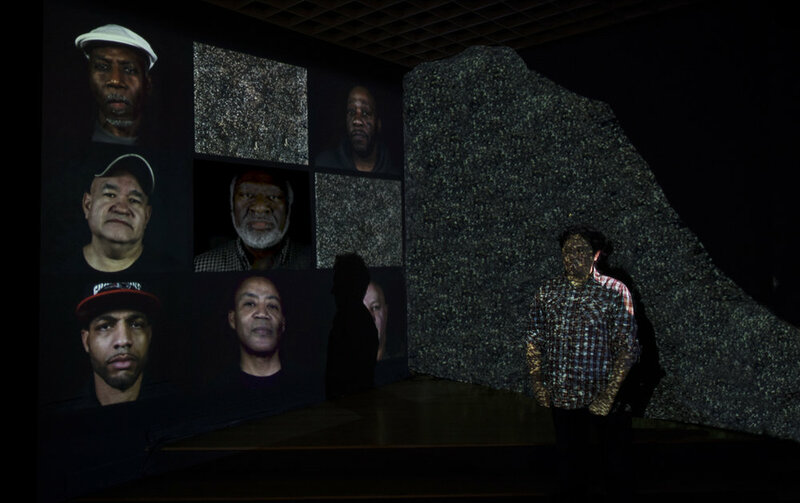 I define this project as a “Poetic Cyber Movement for Social Justice,” where art mobilizes a plethora of voices while utilizing public places and virtual spaces to ignite a more inclusive dialogue to effect social change. Explored through the space of love and intimacy, the project is being developed with community members as creative collaborators. The first chapter of the project was launched in 2017, when I served as Boston Artist-in-Residence with mayor’s Office of Art and Culture and Boston Centers for Youth & Families, in collaboration with Blackstone Community Center in South End and in connection with my role as Research Fellow at MIT Open Documentary Lab. The culmination of these experiences was shared with the public in a participatory media installation at Villa Victoria Center for the Arts, 2017, at the heart of the community where the work was produced. In the second chapter, 2018, the project expanded through collaboration with local artists and partnership with institutions, such as the Federal Probation Office, the newly formed Office of Returning Citizens and my role as public art residence at Boston Center for the Arts. The result was a site-responsive, public sound installation on Tremont St., Boston Center for the Arts public plaza, July - Oct 2018. Installation experience: The installation consisted of two layers of sound played at different intervals. A series of compositions, created from lullabies contributed by fathers in the community, played from 9 am–9 pm each day. In addition, a set of three motion activated sound stations were located in the garden; audiences presence prompted multitudes of stories to unfold; audio documentaries created in conversation with fathers on federal probation. Participatory Public Sound Installation: Three multi-channel sound stations on treetops, 4 motion activated speakers with sound documentaries on garden level, online geolocated participatory website for sound recording and listening; Online geolocated participatory website activated through QR tags for off site sound recording and listening. 2min experience form one of the three stations at Boston Center for the Arts Plaza. At 2018 HUBweek, We The Future conference, I prototyped an immersive participatory installation inside a shipping container; a self-contained model of a complex interactive media installation that could be accessible at any public site as a low budget traveling exhibit, alternative to a gallery or museum space.